12/16/2015Share this story on Facebook! Sabina Leybold '17 (center) shares a laugh with other members of IC's Project Sunshine. Photo by Joshua Glass '19. ​Flashback: It’s my first week of college, and I’m at the Student Organization Fair. Dozens of tables fill the events hall in Campus Center, each one representing a club on campus. In high school, I loved Spanish club and mock Congress, but I’m not quite sure what I want to get involved in here. I write my email address on 20 different sign-up sheets. I’ll figure it out later. Then I see IC Project Sunshine. It’d be hard not to, since bright yellow greeting cards and pink knitted baby hats stand out in the sea of white tri-fold information boards. The hats especially catch my eye, since I’ve been dying to learn how to knit since high school. Their poster reads “No experience necessary!” so I walk up to the table to find out more. I instantly fall in love with the organization’s mission: IC Project Sunshine is a chapter of a national nonprofit that works to create a sense of normalcy and brighten the days of children and their families during long-term hospital stays. The Ithaca chapter creates knitted and crocheted baby items as well as “Sunny Gram” greeting cards to be distributed to hospitals nationwide. At the first club meeting that evening, I find out that the organization needs a new treasurer. Looking to get more involved, I apply, but I’m skeptical that I’ll get the role because of my age and lack of experience with the club. Meanwhile, it quickly becomes obvious that I’m terrible at knitting. My yarn is knotted and my needles are stuck. When I start over, I somehow cast on 171 stitches instead of 48. The hat I think I’m making turns out to be a collar. If the treasurer position required good knitting skills, I’d be out of the running. But my leadership ability and passion for the organization show, and I become IC Project Sunshine’s treasurer in my first semester. Back to present day. 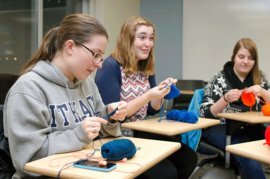 It’s my junior year of college, and I’ve taught dozens of club members how to knit (luckily, nobody has struggled as much as I did when I started). I’ve written and presented budget proposals and helped to plan and facilitate service events. We’ve collectively donated roughly 300 knit items and over 650 Sunny Grams in those two years. And I’m slated to step into the role of executive director when two of our board members graduate in the spring of 2016. When I signed up for IC Project Sunshine at the Student Organization Fair, all I wanted was to learn how to knit. I didn’t expect to make such a huge impact on the community in the process.